I’d like to lose 10 pounds. This is not for health reasons, I confess. I’m fit, in fair shape, and knock wood, no health problems. It is, I confess again, for combined reasons of vanity and comfort: I like how I look and feel when I’m a tad bit lighter. Now, losing weight is not a unique or laudable goal by any means but it is a fine goal so far as those things go. In any event, it is my goal. So, again: fine. But the problem is that as much as I like to lose these 10 pesky ponds, I am a shekamoo. I really, really like to eat. D’uh. I have a food blog! And if you’re reading here, I don’t need to tell you how amazing and awesome food is. In fact, certainly one iteration of heaven might be that it’s a place where you’ll get to eat anything and everything you want, as much as you want, without any consequences. Glory be! Amen! Now, I have mastered portion control when it comes to meals. In fact, not to brag, but I returned from my epic trip to Iran a good five pounds lighter than when I entered Iran. OK, I am bragging but I hope you’ll forgive me, because you see, it was no mean feat to both allow myself to taste and enjoy the seemingly infinite array of incredibly delicious food available to me in Iran, the kind of food that I had been pining for with nostalgia and day dreaming about with drool forming in the corners of mouth, and yet manage to avoid the slippery slope of gorging with reckless abandon. A fine line to cross. Not a line as scary as this but one that did take a good bit of conscious exercise of self-control and self discipline. Discipline and control of self are issues that I have grappled with (with some dire consequences) my entire life and it has taken quite a bit of soul searching to little by little trade my tendency for leaning towards instant gratification and its much darker sibling, self-destruction (hello darkness my old friend) and to instead pause and consider my options and at least make an attempt, feeble as it may be, to make choices that would have positive results. As such, I am indeed proud of having gained (ha, unintended pun) somewhat of an upper hand in this battle arena and thus hope you’ll pardon me as I pat myself on the back. Pat, pat, pat! Anyhow, like I said I’m more or less in control when it comes to meals but my Achilles’ heel is that I love and crave to munch on a snack. And by snack, I mean a fun snack. And by a fun snack, I of course mean: junk food. Heavenly heavenly junk food! Boy do I love junk food. For awhile, I’ve assuaged this craving by munching on Sour Power Straws. Here are the pros: they are sour and chewy in the most wonderful way; there are 9 straws to a package thus allowing one to get a good bit of noshing mileage out of it; and at 175 calories, so not a big deal. I almost burn as much walking to the deli! (I also see things like this when I go to the deli. Which: my eyes! Lord have mercy!) But Sour Power Straws take their toll on the surface of the tongue and I do enjoy and value my poor tongue and its awesome taste buds so it was time for me to turn towards something else. As much as I enjoy sweet things, give me sour and salty any day, and if you make it crunchy too, I will go weak in the knees and start drooling. Like: salt and vinegar potato chips? Oh my gosh. I could eat a mountain of those! So with crunchy being the operative word, I thought: pop corn! And I tried to figure out a way to make it taste salty and sour in the best way possible. Sadly, a bag of pomegranate powder I’d bought in the hustling and bustling Babolsar market in the Caspian sea northern region of Iran, one that I had duly and lovingly carried back to the U.S with such high hopes and tender dreams, left me heartbroken by going all bad and moldy. Otherwise, I would have melted butter and mixed it with the aforementioned tangy sour awesome pomegranate powder. But now what? It was back to Persianizing square one! It is a truth by now universally acknowledged that when it comes to Persianizing food, you throw the following at it: rosewater, saffron and cardamom. Ahu of Ahu Eats (a wonderful fellow Persian food blogger) calls it “the holy trinity of Persianizing!” Ha! Good one! The Persianizing trifecta! 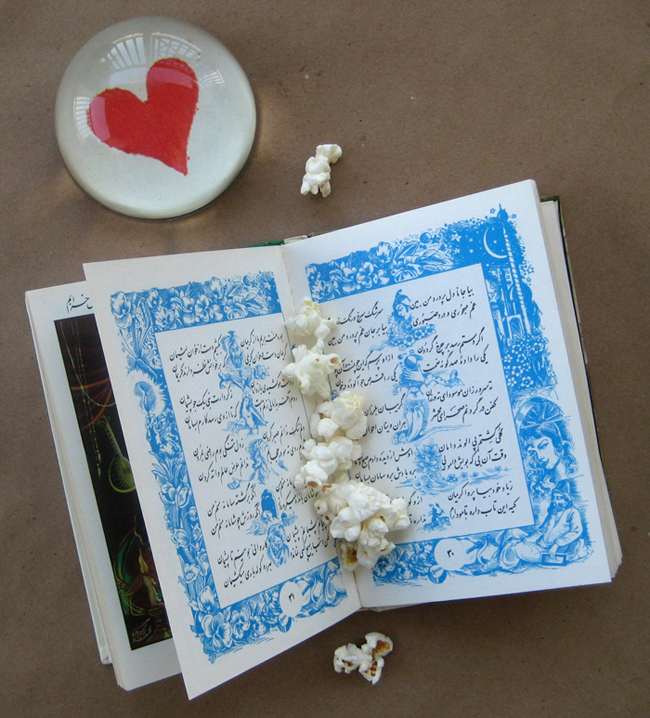 Now, the mere thought of either rosewater or cardamom with pop corn makes me pucker up — and not in a good way. But saffron and popcorn? Totally makes sense. And guess what? Hot freshly popped corn sprinkled with salt and drizzled with a melty concoction of butter and saffron tastes really good. Shocker, I know! Alert the press! And I know, I know, butter is not that great when you’re aiming for preserving your girlish figure but a little of it goes a long way. I mean you don’t have to drench the pop corn with butter, just add enough to give it depth of flavor and taste. Anyway, I made this Persianized saffron butter pop corn for company at some point. And these were their reactions: “ummm, it tastes good!” one said, munching away. The other said: “mmm, this is good!” And yet another announced: “It’s kind of like ta’dig!” Now, hold your horses, I wouldn’t go that far! Amanda Fatherazi (doll designer par excellence) suggested: “how about a #persianversion of caramel corn; add a coating of sohan asali for some extra crunch!” Which, my oh my, that is such a mouthwatering idea! But I’m afraid of making sohan assali as documented here! My Persian Kitchen (another fellow Persian food blogging friend) said: “oohhh I love making homemade popcorn and persianizing it! !” Which reminds me, I have to ask Sanam how she Persianizes her pop corn. Royal Montgomery summed it up brilliantly by quipping thusly: “Recipe: add popcorn to Hafez. Mix well. eat popcorn & read your fal.” Perfectly said! And with that, we finally arrive at the recipe portion of our programming. What a long post for such a short, simple and basic recipe. I feel bad, like maybe you’re not getting your money’s worth! But anyhow, finalement, the recipe: voila! Edited to add Suzanne’s inspired idea of finishing off the whole thing with a dusting of sumac. Which sounds very good: it will add just a touch of tartness to the whole buttery saffron-y affair and I expect will be yum. Put popped corn into large a bowl and sprinkle with coarse sea salt to taste. Melt butter. Dissolve saffron in 2 tablespoons of hot water. Add to melted butter and stir to mix. Drizzle over popcorn and toss until well coated. That’s a great idea. I personally gain weight by only looking at Persian food!!! LOL! Indeed, it is very possible to gain weight by looking at some Persian dishes. Worth every ounce though! So original. I call that creativity. Sweet , salty, sour, spicy doesn’t matter. This combo works& that’s what is important. It is very clever Azita joon. I think u nailed it in creativity department if u ask me. I like that. Lovely post, Azita. Your popcorn sounds fabulous! I also want to loose ten pounds while eating butter-drizzled popcorn. Problem is: when I make popcorn, I eat the entire batch myself… ha ha! Ha ha, me too, Darya jan! If junk food is in the house, I shall eat it, size and portion no deterrent. Lovely to see you around here. Dear Flora, I hear you! 🙂 Trust me, I indulged way too often with reckless abandon and paid the price and I still dabble more often than not. It’s good to TASTE, isn’t it? Who can resist? 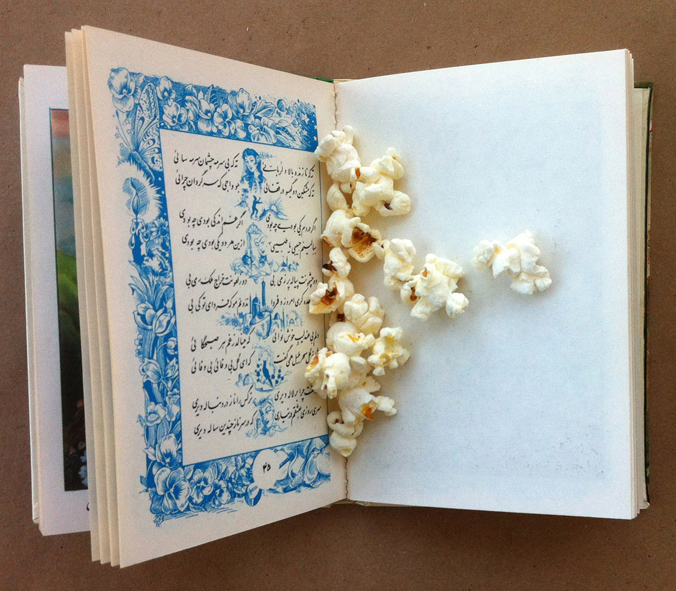 The photograph of the popcorn in the book is beautiful. Can the small amount of butter be fattening? surely its cancelled out by the healthy vegetable its covering. Is it just pop corn or does it work with any other type of food stuff?!! This is hilarious and awesome – I love everything about it!!! I think we’re on to something with the ‘holy trinity’ there, and your serving size of ‘a few shekamoos’ made me giggle. Wonderful post, I really enjoyed reading it. p.s. you are perfect the way you are! Anita you look fantastic and IMHO don’t need to lose an ounce. That said I understand the need for portion control. We eat too much here in America. I love your Persianized popcorn saffron and butter sound wonderful, I’ll take it a step further and dust with some sumac. Think I am going to try this. Thank you Suzanne joon and LOVE your idea of dusting with sumac and in fact edited the post to reflect your inspired idea. Of course! It’ll add the perfect tartness to balance out the whole thing. YUM! Saffron butter? Is that even legal to combine such precious ingredients and then pour them over popcorn, Azita? What a great way to lose weight. I know a thing or two about vices. I think working out is the only thing saving me. Work hard eat hard is my motto. 🙂 Nice to see you here. I know, it should be illegal, right? Amanda, your know, your motto is one that I have to say I actually love and try to practice and embrace as much as possible. I’m willing to ride the bicycle for an hour if it lets me enjoy something decadent later on. And aha, little by little I’m getting to know you and before you know it we will be having coffee and I’ll try to pry a vice or two out of you. 😉 Thank you so much for visiting and commenting. They always, always, brighten my day. Rosewater, saffron and cardamom. I’m going to have to remember that and try it out ! I’m feeling about 6 pounds over my happy weight too Azita… Perhaps I should have made your saffron popcorn today, instead of the Honey Cake that I did! 😕 Blogging each week about food certainly makes it a little difficult – I can relate completely my friend! 🙂 Love the sumac idea too – sounds delish! 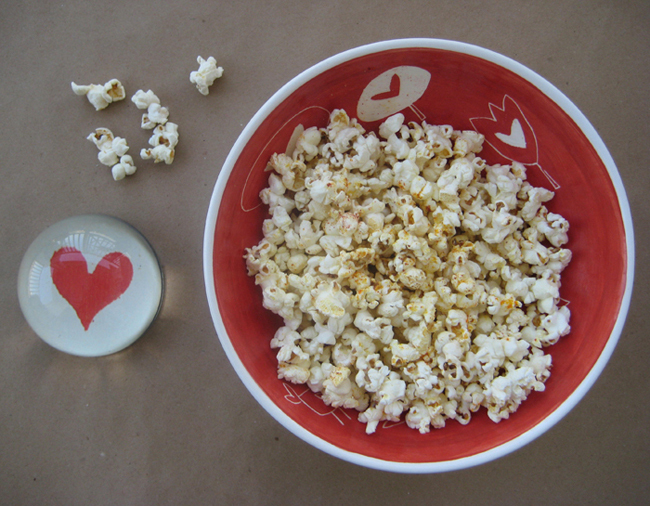 Saffron and sumac on popcorn…genius! Must try this soon. I love popcorn. Just made it last night with olive oil, yeast and herbed salt. But I’m liking this idea a lot. It’s been a year of sumac for me as well. Hi Wendy, me too: Love grazing! ha ha. cheers! I’ve sent you a message at your FB page.